Citation Information: JCI Insight. 2016;1(6):e86660. https://doi.org/10.1172/jci.insight.86660. A CD4+CD146+CCR5+ T cell population in allogeneic HCT patients at GVHD onset and prior to GVHD onset. (A) Representative plots showing CCR5 and CD146 expression in samples from patients with GI-GVHD, without GVHD, with non-GVHD enteritis, and with skin GVHD. (B) CD4+CD146+CCR5+ T cell frequencies in healthy donors (HD), autotransplant patients (Auto), and allogeneic patients. n and median post-HCT onset of signs or samples are shown below the graphs. The data are shown as mean ± SEM, 2-tailed Student’s t tests. 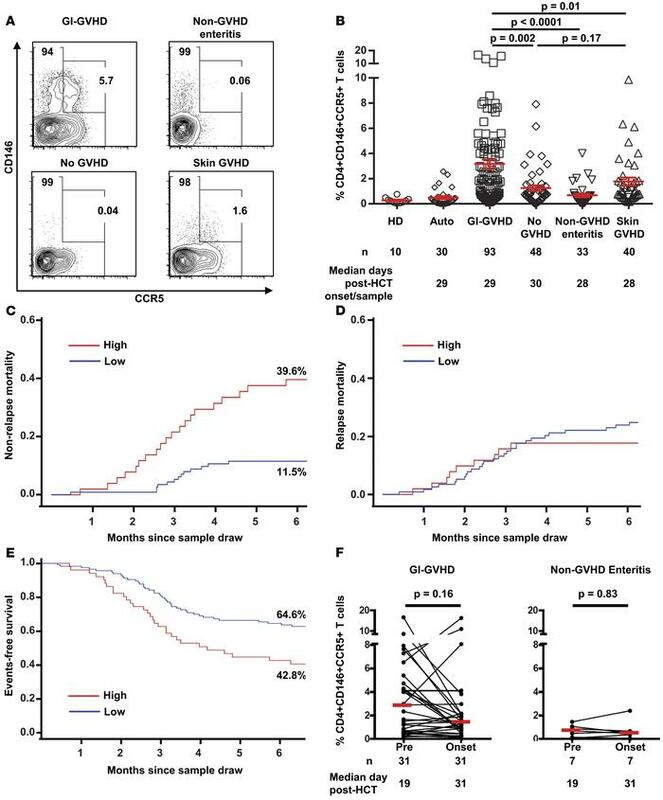 (C) Six-month nonrelapse mortality since sample draw in allogeneic HCT patients with symptoms (GI-GVHD, non-GVHD enteritis, and skin GVHD, n = 166) divided by low and high CD146+CCR5+ T cell frequencies. High-risk group in red (CD4+CD146+CCR5+ T cell frequency ≥ 2.3%, n = 51) and low-risk group in blue (CD146+CD146+CCR5+ T cell frequency < 2.3%, n = 115), P = 0.001, calculated for the overall curve. (D) Six-month relapse mortality since sample draw in the same population, P = 0.64. (E) Six-month event-free survival since sample draw in the same population, P = 0.002. (F) CD4+CD146+CCR5+ T cell frequency in paired samples prior to GVHD onset in GI-GVHD patients (n = 31) with a median interval of 14 days between the first measurement and measurement at onset of disease and at matched time points in non-GVHD enteritis patients (n = 7), paired t test analysis. Cumulative incidence (C and D) and Kaplan-Meier analysis (E) used.